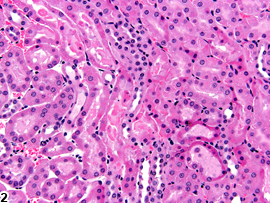 Kidney, Renal tubule - Necrosis in a female B6C3F1 mouse from a chronic study. Diffuse tubule necrosis appears as lighter-staining, more eosinophilic tubules. 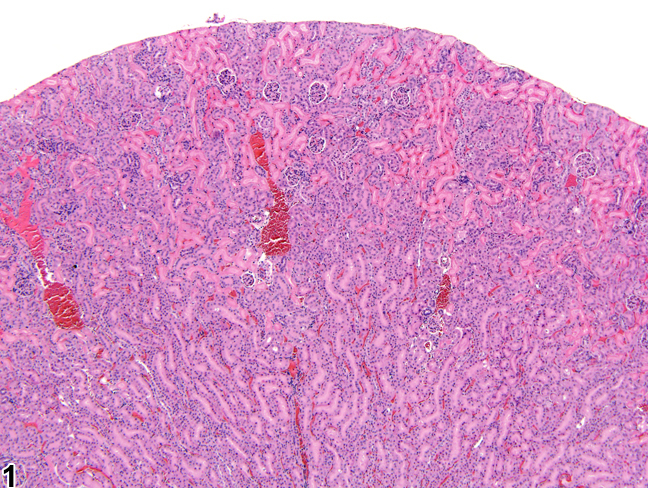 Kidney, Renal tubule - Necrosis in a male B6C3F1 mouse from a subchronic study. Scattered tubular epithelial cell necrosis and sloughed necrotic epithelial cells are present. The diagnosis of necrosis encompasses death of individual cells, to focal or multifocal areas of tubule necrosis, to larger confluent areas of renal parenchyma necrosis ( Figure 1 ). 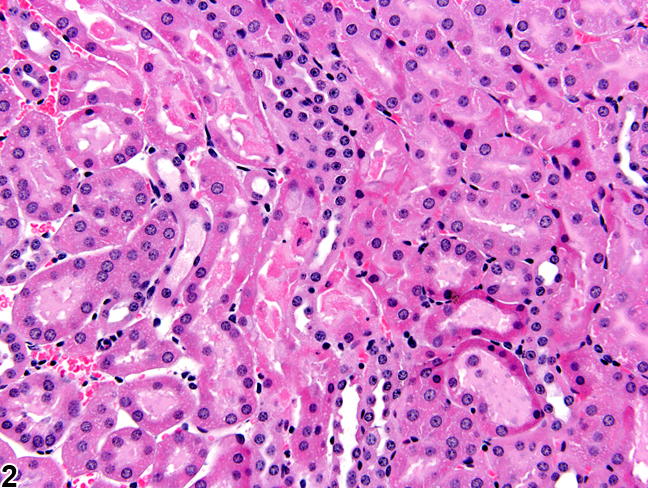 Necrosis may be seen anywhere in the kidney. Typically, it is characterized by cell swelling, cell fragmentation, cytoplasmic tinctorial changes, and karyorrhexis ( Figure 2 ). Necrotic renal tubule cells quickly slough off into the tubule lumens. Granular casts within renal tubules are indicators of previous necrosis. 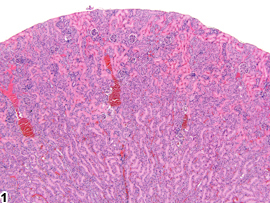 Inflammation is seldom observed in association with acute tubule necrosis. Necrosis should be diagnosed and given a severity grade. Necrosis associated with the presence of a tumor should not be diagnosed but should be described in the pathology narrative. Secondary changes, such as regeneration and inflammation, should not be diagnosed separately, unless warranted by severity, but should be described in the narrative. Renal tubular necrosis must be differentiated from artifact. Harriman JF, Schnellmann RG. 2005. Mechanisms of renal cell death. In: Toxicology of the Kidney (Tarloff JB, Lash LH, eds). CRC Press, Boca Raton, FL, 245-297.